CBS called on WorldStage for video support as Carnegie Hall’s famous stage showcased the latest CBS stars and shows. WorldStage was charged with expanding display beyond the hero screen to incorporate the architectural elements of Carnegie Hall’s proscenium stage. The network wanted to display content across the big canvas of a stage more accustomed to hosting symphony orchestras than upfronts. WorldStage used 18 projectors to cover the display surfaces: 16 brand new J-Series Christie Roadster HD20K-J projectors, plus a pair of Christie HD10K-M projectors for rear projection on the ‘Mousehole’ entrance. Switching was performed with three Christie Vista Spyder X20s, which managed and distributed the content from 22 Dataton WATCHOUT servers. WorldStage used projection positioning, warping and masking to create an almost 3D projection mapped feel to the set. “This show is a collaborative effort. 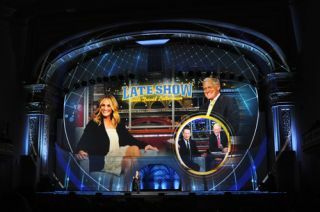 All of us on the CBS team work hard to create something special and a little different each year,” Oatey said.